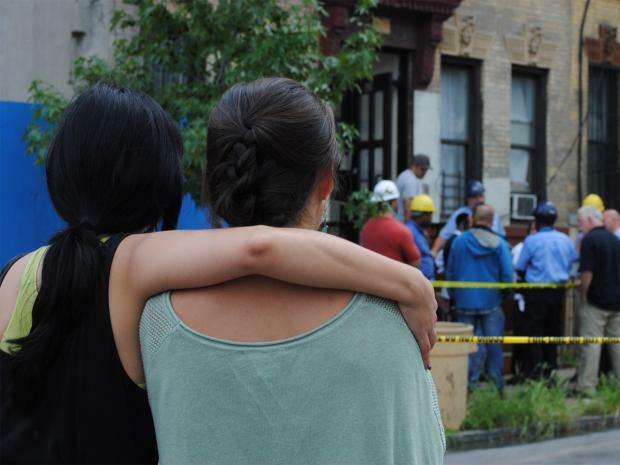 BROOKLYN — Residents from two buildings in Bushwick were evacuated Wednesday after one of the foundations became compromised by nearby construction, authorities said — just a day after inspectors were called there and found no violations, according to city records. Firefighters raced to 420 Melrose St., near Irving Avenue, about 9 a.m. and found the four-story building with cracks running running up the front and one side, fire officials and residents said. Matt Brogan, 29, an architectural consultant who has lived there since April, said a sinkhole had formed in his backyard over the last couple of days. "There had been some settling, which is normal, but no cracks," Brogan said. "Then something happened between yesterday afternoon and last night. He said cracks began forming in the building — including his bedroom wall — some time later. "Some as big as an inch across," he said of the cracks. "You can stick your hand in." A concerned caller complained Monday that excavation work at nearby 424 Melrose St. was causing "extreme trauma" to the building, shifting it and jamming the doors in their frames, according to city records. The caller expressed fear the building could "fall into a hole," the records said. An inspector came to the site the next day but said "no violation [was] warranted for complaint at time of inspection," according to the records. DOB officials said that inspectors had visited the site several times since the Bronx-based firm Procida Construction Corp. began working there in June and inspectors issued five violations this summer, spokesman Tony Sclafani said. A partial stop work order from July 27, banning excavation within 10 feet of the damaged building, was still in effect Tuesday, when inspectors found "no evidence of cracks," Sclafani said. "We are investigating what work was performed since that time [of the inspection]," he said, "and if that work violated the stop work order." Procida officials were not immediately available for comment. FDNY Deputy Chief James Campbell said firefighters quickly evacuated residents from the building and the one next door, fearing 420 Melrose St. might collapse. Construction at 424 Melrose St. — where a backhoe was still parked in a pit Wednesday afternoon — may have caused the instability, Campbell added. Inspectors from the Department of Buildings were on scene evaluating the stability of the building. "We're hoping they'll shore it up so the residents can reoccupy," Campbell said. Red Cross workers were setting up displaced residents into other local buildings. "We're hoping for the best, but tentatively expecting the worst," said Justin Lamb, 30, who works in advertising and has been living in the building for about a year. "We just don't know." NYPD community affairs officers notified residents of 420 Melrose St. that their apartment building will be vacated for at least three to five days. The backhoe in the pit next door was up and running placing more dirt up against the wall to better secure the building.